About 1,000 protesters have held a rally outside a site given the green light to start fracking for shale gas. The divisive process resumed in the UK on Monday for the first time since it was linked to earthquakes in 2011. 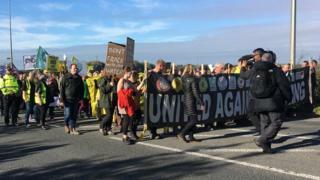 Demonstrators at Little Plumpton in Lancashire, led by the first UK anti-fracking protesters to be imprisoned, said “fossil fuels had no place in a modern-day energy strategy”. Energy firm Cuadrilla said the process is safe. One protester said she came out “because in the long run, it’s going to affect all of us – not just Lancashire”. A spokesperson for the Frack Free Lancashire campaign group said the operation “will be met with continued protest and resistance”. On Monday, Cuadrilla chief executive Francis Egan said fracking at the site could lead to “tens of thousands of jobs and… could also reduce emissions because it will be better than importing gas from far afield”. The firm said it will spend at least three months fracking two horizontal wells, and then it would test to see if the gas flow was commercially viable. If it is successful, up to 20 wells could be built. Three men who were jailed for a previous protest led Saturday’s march, which also highlighted concerns about climate change. Simon Blevins, Richard Roberts and Rich Loizou were imprisoned after climbing on lorries at the Little Plumpton site but released on Wednesday after judges ruled their sentences were “excessive”.